Firetron has been in the fire and gas detection and suppression industry for more than 25 years. We are specialists in the design, manufacture, installation and servicing of fire and gas detection, fire suppression systems, breathing apparatus and safety equipment for marine and land-based applications. With teams of skilled technicians and offshore fire and gas safety maintenance engineers, Firetron carries out annual certifications of fire, gas and breathing air safety systems for the marine sector. Firetron supplies, installs and maintains a wide range of fire detection and suppression systems for both land and marine applications. 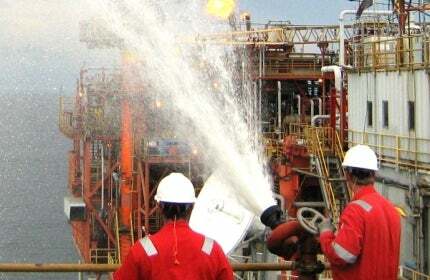 Our engineers carry out annual fire equipment inspections, maintenance and certification. Our systems and services include breathing air analysis, SCBA, EEBD, escape sets and various breathing apparatus. Annual testing is carried out in compliance with NFPA 1852 and EN 137, using POSICHECK3 for computerised dynamic testing and certification. Firetron is an authorised distributor and service centre for both the US and UK range of Scott products for Southern and West Africa. Using our Retrotec Q5E blower door kit, we give you accurate hold times and advise on ways to improve these hold times. On-board hydro testing of cylinders can be performed, including SCBA and certain extinguishers that can be refilled on board. Our supply to the African industry is constantly expanding. From our head office in Cape Town, South Africa, Firetron provides service to a wide range of areas, including Angola, Congo, Gabon, Cameroon, Ghana, Mozambique, Tanzania, Namibia and South Africa. USCG accepts our annual certification, which must be carried out during their annual inspection. As Firetron is also approved by ABS and RINA, our approval is generally accepted by the various members of IACS, including CCS, DNV, GL, IRS, KR, Lloyds, NK and RS.